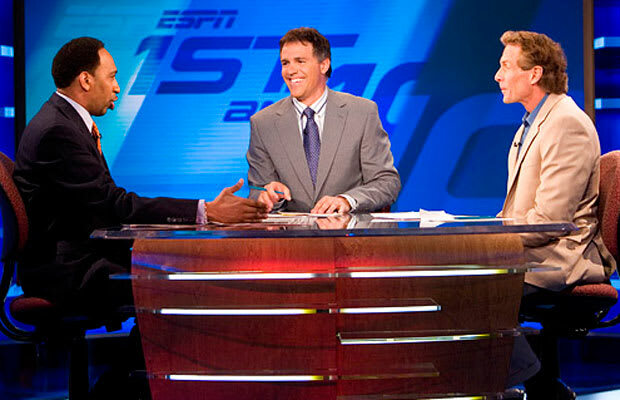 The plight of a typical ESPN storyline: SportsCenter opens with an already tired debate of Albert Pujols and where his slow start ranks on the “panic meter.” The ironically named First Take stages an argument between Skip Bayless and Stephen A. Smith, where Bayless takes the knowingly ludicrous position that “Pujols will never hit another home run in his career.” The story is thrown in the microwave until it crusts over by SportsNation, where Pujols is given the dreaded “third jeer.” And finally, just to make sure your brain is good and fried, it goes through the dipshit gauntlet at Around the Horn, ping-ponged about on Pardon the Interruption, and finally commits a silent suicide on Numbers Never Lie where (thank Based God) nobody is watching. Through the spew-swallow-spew process average events become controversies, especially privileged teams become more played than “Call Me Maybe,” and the reporting process becomes about manufacturing content. ESPN creates and promotes “Tebow-Mania,” “drinking in the Red Sox clubhouse,” and “Favre&apos;s return to football,” while, simultaneously, reporting on it. The network becomes more about producing and hyping events than, you know, actually covering them.